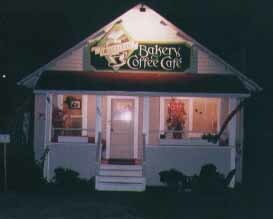 Open Monday thru Friday from 8 am to 4 pm, we offer a full selection of homemade and fresh baked muffins, scones, bagels, cookies and pastries plus a selection of award-winning Full City Coffee and espresso drinks. Lunch is served 11 am to 3 pm daily, offering a complete menu featuring homemade soups, a variety of fresh salads and creative sandwiches on our home baked breads. Our award-winning New England clam chowder is served every Friday! Each month, we feature a different local artist, showcasing local painter, potters, photographers and mixed media artists. We are also available for private parties and holiday catering and we welcome special bakery orders.